First Minister of Wales Carwyn Jones has congratulated pupils from West Wales on their campaign to educate people about Fairtrade footballs. The campaign, which highlighted the meager wages and poor conditions endured by many football-stitchers in developing countries, was Highly Commended in awards presented by the Fairtrade Foundation. 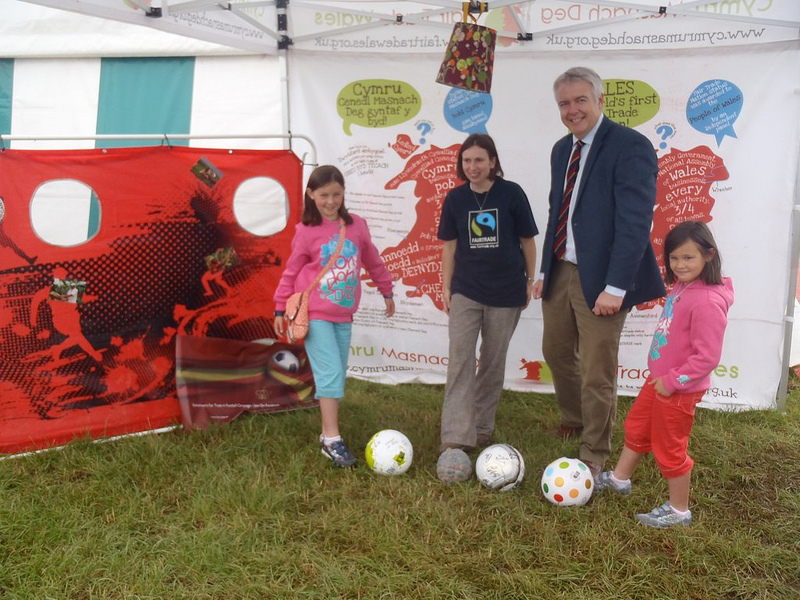 The First Minister met pupils and teachers from Tavernspite County Primary School, Pembrokeshire, at the Fair Trade Wales stall at the National Eisteddfod of Wales where he praised their efforts to raise awareness of the issue. First Minister Carwyn Jones said: “I am very proud that Wales continues to lead the way in supporting Fair Trade. The number of Fair Trade schools, towns and local authorities keeps growing, more businesses are embracing Fair Trade products and awareness has increased across the country. “I would like to offer my congratulations to Tavernspite County Primary School on their success in the Fairtrade Foundation Awards. It is encouraging to see the dedication and hard work of young people in Wales in supporting and promoting Fair Trade. Their commitment is playing an important part in helping thousands of developing country farmers and producers to trade their way out of poverty”. The Margaret Demidecka Fairtrade Awards are given by the Fairtrade Foundation to primary and secondary schools for activities held during the annual Fairtrade Fortnight. The pupils at Tavernspite learnt that many workers receive just 22p per ball compared with the vast sums received by many professional football players, and often have to endure poor and hazardous working conditions. In addition to workshops and assemblies, the school held its own Fairtrade football tournament to raise awareness in the local community, and wrote to national clubs to persuade them to purchase Fairtrade footballs for their teams.